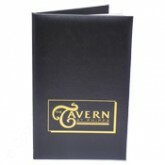 Deluxe Menu Covers come with wide variety of quality cover materials. 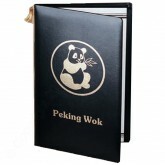 We produce and supply these simple and elegant folder menus, folded menus which can hold a laser printed menu loosely. The Options for a permanent menu attachment are available by the following methods: fastening the menu inside with a tassel or barbed end stretch cord through eyelets –or a stretch cord with tassel or ball end can be wrapped around the spine. All of these methods allow quick change-ability of the printed menu. If you wish a menu cover of traditional styling but have single menu pages, clear vinyl holders can be sewn into the spine – the stitching will not show on the exterior of the menu. Thus the deluxe menu cover can hold 4 or 8 single pages allowing menu changes to be done a page at a time on your laser printer. Click Here to Request A Quote for Deluxe Menu Permanent attachment methods. 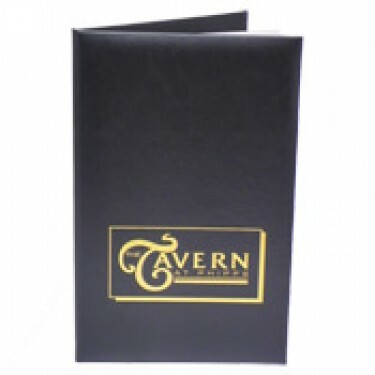 Deluxe Menu Covers-8 1/2 × 11"
Deluxe Menu Covers-5 1/2 × 8 1/2"
Deluxe Menu Covers-8 1/2 × 14"